Morning sun coming through the window warmed the baby's pink-blonde head and Madeleine's darker, blue-veined breast. The aroma of peaches drifted to her from the bushel baskets in the kitchen. Rows of glass jars, lids and screw tops waited on the big pine table. The baby's sucking slowed. His eyelids fluttered and shut. Between the reddening sumacs along the dirt road, a man bobbed along, arms swinging, body flickering against tasseled corn. He crossed the wooden cow bridge and negotiated the maze of tractor tires, rusty harrows and empty chicken cages that led to the farmhouse. She laid the baby in his playpen, slipped a sweater over her milk-stained T-shirt. Before the mirror in the hall, she ran her fingers through her long black hair, straightened her lopsided breasts. Cory had warned her about the sorts who might come to the remote hill farm. Last year, deer hunters up from Massachusetts raped a woman in the next county. Bums with cigarettes burned down barns. Thieves claimed they were repo men. The man, as he crossed the creaking porch, looked like none of Cory's sorts. He wore a backpack and khaki shorts. His floppy-brimmed hat was flowery, and he wore it tilted back. Men here sheltered under long-billed caps. At church, their foreheads were pale, waxy. She started at the confident rat-tat-tat. A shotgun stood in the hall closet. Despite her protests that she'd never use it, Cory had once made her load it and ready it to fire. This morning, when he told her that the milk yield was down, that they'd need credit to buy winter feed, his eyes were bloodshot and teary. He clutched the baby tightly. 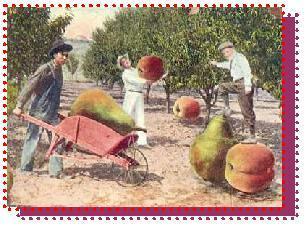 He brought her the last of the peaches from the big cooler. She watched his truck accelerate away, saw his brake lights flash red at the cow bridge. She opened the door. The man stepped back clutching his floppy hat. His gray hair lay in damp curls against his forehead. "Excuse me," he said. "How far it is to the next store?" At least he wasn't looking for work, or money, or to use her telephone. Through the screen door, she smelled a faint tang of soap. "Hard to say," she said. "We drive everywhere." Half hour to Cory's church. An hour to the big grocery store. The man shifted position. His legs were tanned, muscular. He smiled. "I lived in Texas once. Bit of a shock after London, where everyone walked or took the Tube." Was he English? Hadn't she once told Cory Englishmen had odd habits? "You mean 'Australians'," he'd snapped back. She imagined Cory arguing with his loan officer, furious about the interest rate, getting drunk. Staying away until morning. Should she offer the man water? She hesitated. There'd be no one around until evening, when a hand came to milk the cows. "There's a store on the way to town," she said. Cory ran a beer tab there, but she'd never stopped, not even for gas. "About five miles away." The man's smile collapsed. He plopped on his hat, said "Thank you, Madam." Crossing the cow bridge, his arms swung lower. She weighed peaches, matched jars with lids and screw tops. She slid a juicy slice onto her tongue. Surely he hadn't slept rough? Where had he walked from this morning? She washed the sticky peach juice from her hands, searched the telephone directory, found the number of the store. A recording said, "Number disconnected." She diapered the baby and strapped him in his car seat in Cory's old truck. They bumped along the washboard surface of the dirt road in a cloud of dust. She had planned, when she caught up, to hand the man food and water through the window, but seeing his dogged trudge, she pulled ahead and unlocked the passenger door. He slid along the bench seat and stowed his backpack between his big knees. His Adam's apple bobbed as he swallowed the water. He closed his eyes and inhaled the scent of peaches. He ate Cory's untouched breakfast biscuit. "Hugh," he announced, reaching over the baby to shake her hand. "How did you arrive in frosty New England?" "In Puerto Rico, two years ago, I met a man wandering on a beach, separated from his friends." "Puerto Rico," he said softly, imitating her inflection. "Lucky man. Can't say I've ever met anyone interesting on a beach." "You've never been to San Juan." She'd been an old maid schoolteacher. Her friends had coaxed her to show the shy farmer a good time. Cory was handsome, a burly blonde with a photograph of a farmhouse, big and white against rolling fields and a dark forest. Later, she discovered he'd left school at fourteen. The store was boarded up, but a wisp of lace curtain like a frill on a slip fluttered from a window above. She had never noticed the apartment before. It seemed a significant oversight. "After walking twenty miles, I would have curled up and died here, Madeleine." "Twenty?" They laughed at despair so narrowly averted. He unfolded his map and they spread it between them over the sleeping baby. Tiny squares represented Cory's farm. Roads intersected vein-like, at acute angles. Hugh traced his intended route with a well-manicured finger. Their shoulders brushed. She smelled pine and road dust, the odor of fresh perspiration. Cory, arriving home late, smelled of beer and cigarettes. He slept heavily beside her. He no longer woke her with caresses and she was happy to be left alone. The truck bumped past fields, pine forests and rocky granite outcrops. The baby stirred, kicking and rooting. Outside the only motel in town, he hesitated. "Why not come with me and feed him while I shower?" he said. Giddily, she watched Hugh boost the baby to his shoulder, expertly pat his diapered behind, plant kisses on the creases of his baby neck. 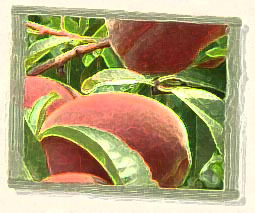 Breathlessly, she imagined fruit flies hovering over fuzzy-haired peaches in her warm kitchen, saw passionate swarms gathering over Cory's bushel baskets, smelled the sweet-sour perfume of decay. Mary McNulty is an Irish-born writer of fiction and nonfiction. She lives with her husband and children in Maine. She is a past winner of the Associated Writing Programs Intro Award and the Saskatchewan Writers Guild's Long Grain of Truth contest for nonfiction. Her work has been published in Willow Springs and Grain. Currently, she is a member of Literary Refugee Camp, and online writers workshop. a short trot through cultured minds and wayward settings. We look forward to seeing short stories from every writer's native shore. It does not matter if you have never seen the sea and breathe only inland waves of wheat or rye ~or big city fumes~ we'd like you to share your innermost native shore with us. Along with our Storycove Flash Fiction (a story of fewer than 500 words) we are pleased to offer to our newest department for standard length short stories (500-4000 words). To launch this department, we have selected a new symbol, a rare shorebird known as the slim-billed curlew. Like a great short story, this bird is unique. Call for Fiction: The reading period for The TenTen Fiction Contest runs annually from May 1 to the deadline of July 1. The winner is published in our Native Shore Fiction department in the autumn edition of Word Smitten. Word Smitten awards a $1,010.00 prize for best short story. Awarded annually in the late summer. Important: Read the guidelines and enter your short story: GUIDELINES for The TenTen.